Whaleback Retreat is a great place for a family getaway or a group of friends looking to enjoy a wine tour and all the beauty Leland and Norther Michigan has to offer! We are located on North Lake Leelanau just south of Leland Village. This spacious house overlooking the lake from Whaleback Hill has 200 feet of lakeshore across the street! Everything you need for a perfect opportunity to be together has been given careful thought by the owners. The master bedroom in the upstairs is a getaway in itself with its comfy king-sized bed, peaceful woodsy views and roomy bath with walk-in shower. The other four bedrooms are beautifully decorated and each have a queen-sized bed. Three of the bedrooms have balconies with seating and lake views. The house has a full kitchen on both levels that allow for lots of room to cook or allows for guests to enjoy some quiet time separately. Views of the lake are enjoyed from the open living/full kitchen/dining area in both the upstairs and downstairs areas that can be closed off for privacy if needed. Lake gazing is required when savoring morning coffee on any of the balconies or decks and while grilling on the patio. Of course, it's then up to you if you head down the hillside stairs, across the street & jump right in! Whether you are up to relaxing, wine tasting on Michigan’s largest wine trail, hiking Sleeping Bear Dunes, down hill skiing, snowshoeing, cross country skiing or snowmobiling on many of the great trails, boating Lake Leelanau or Lake Michigan, ice fishing, sporting, staring at the water or blazing a mountain bike trail in the summer, Whaleback Retreat has it all! This year around getaway will always make you feel at home. We fell in love with the Leland area and knew that we wanted to share our interest in the area with others. We enjoy kayaking, hiking, skiing, fishing and relaxing by the fire. 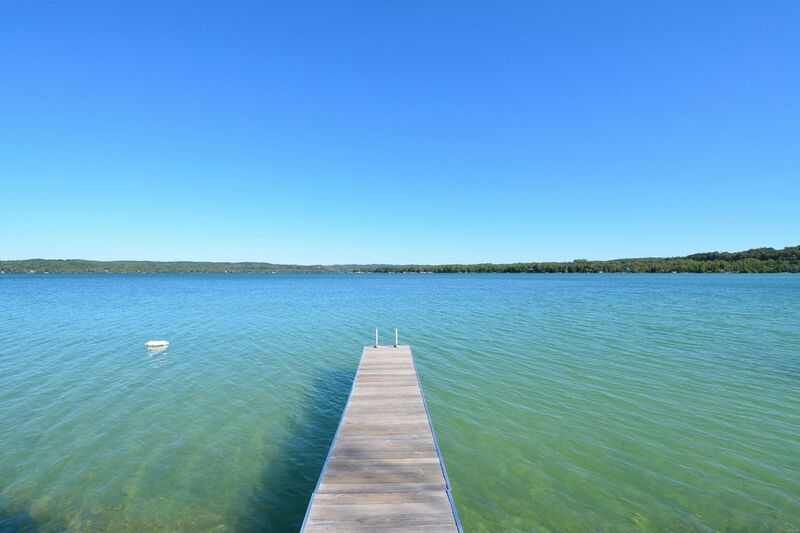 We have a beautiful view, access, and across the street frontage on North Lake Leelanau. Main house has forced air heat. Apartment has gas stove heat. We are located right up the road from historic Fishtown in Leland (make sure you eat at the Village Cheese Shanty). In the area you will find...Wineries, Art Galleries, Fishing, Beautiful Beaches, Bird Watching, Great Food, and Casinos. You will also be a short driving distance to many attractions through out the year like the Manitou Music Festival, Leland Food & Wine Festival, Leelanau Conservancy Natural Area, Day Trips to the Manitou Islands, Traverse City Cherry Festival, Traverse City Film Festival, Sleeping Bear Dunes National Park, Interlochen Performing Arts Academy Concert Series, Fall Color Tours, and Skiing.